My Southern Pecan Pie is the only pecan pie recipe you will find in my recipe box. It came from my mama’s best friend and next door neighbor of 45 years, Ms. Betty Robinson. Between Thanksgiving and Christmas, Ms. Betty made her Southern Pecan Pies into the most delectable mini pie tarts you have ever tasted. She stacked them in a pretty glass covered cake plate that stayed in the middle of her breakfast table. Ms. Betty and Mama got together every afternoon for 5:00 coffee and Ms. Betty’s Pecan Pie Tarts were the standard treat during the holidays. I never turned down an invitation to join them when I was home for a visit. These were memorable times with two precious gentle Southern women and I miss them dearly. Ms Betty’s Pecan Pie was one of the first recipes I pulled from my recipe box in the early days of No Time 2 Cook. Many were sold throughout Mississippi to my loyal farmers market friends. It warms my heart to share the recipe with my Facebook fans and website followers. Careful though, as once you begin baking and taking these pecan pies to family events, you’ll be in charge of pecan pies from here on out. My Southern Pecan Pie recipe makes 2 traditional 8″ pies or 16 mini pecan tarts. Since I’m usually in a hurry to get these pies cooked, I buy store bought frozen pie crusts. I can’t remember when I made a crust from scratch. 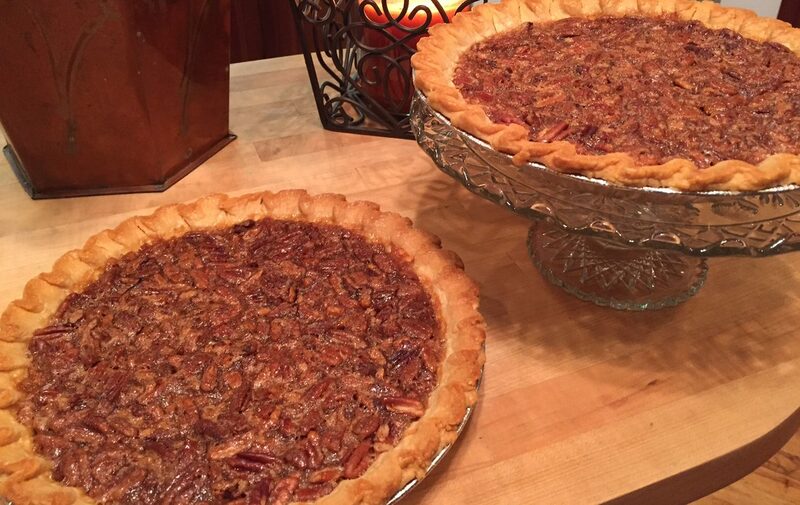 These pecan pies freeze beautifully allowing me to make all my Thanksgiving and Christmas pies at one time. The frozen pie shells in disposable pans are really handy for freezing multiple pies ahead of time. For the full recipe for my Southern Pecan Pie click here. Down here in Mississippi, we say “puh-kahn” pies– sorry, not “pea-kan” pies.